Dirk Schlimm is Associate Professor in the Department of Philosophy and Associate Member in the School of Computer Science at McGill University. He is also an External Member of the Munich Center for Mathematical Philosophy (MCMP), Ludwig-Maximilians-Universität, Munich. He received his PhD from Carnegie Mellon University in 2005, and studied previously at Trinity College Dublin and Technical University of Darmstadt. My research interests fall into the areas of history and philosophy of mathematics and science, epistemology, and cognitive science. In particular, I am interested in the developments in the 19th and early 20th century that led to the emergence of modern mathematics and logic, and in systematic investigations regarding axiomatics, the use of notation, analogical reasoning, concept formation, and theory development. I am also involved in editorial projects of the works of Pasch, Hilbert, Bernays, and Carnap. My paper "Extended mathematical cognition: External representations with non-derived content" (with Karina Vold) has been published in a Special Issue of Synthese online (January 2019). 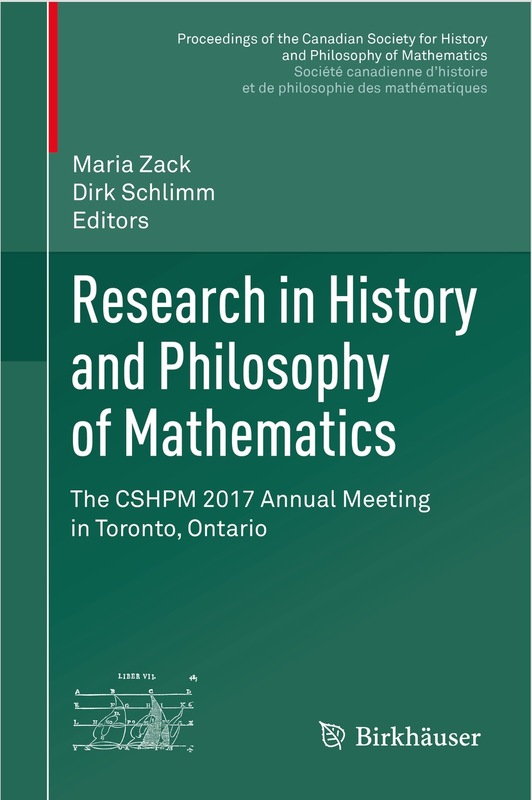 The proceedings of the CSHPM 2017 Meeting in Toronto, edited by Maria Zack and myself, have been published in the series Research in History and Philosophy of Mathematics. (September 2018). My paper"The cultural challenge in mathematical cognition" (with Sieghard Beller, Andrea Bender, Stephen Chrisomalis, Fiona M. Jordan, Karenleigh A. Overmann, and Geoffrey B. Saxe) has been published in Journal of Numerical Cognition, 4(2): 448–463, September 2018. On July 6–8, 2018 I co-organized a workshop with Marianna Antonutti Marfori on Proofs and Representations at the MCMP, LMU, Munich. My paper "Numbers through numerals. The constitutive role of external representations" has been published in Sorin Bangu's collection Naturalizing Logico-Mathematical Knowledge: Approaches from Psychology and Cognitive Science, February 2018. The proceedings of the CSHPM 2016 Meeting in Calgary, edited by Maria Zack and myself, have been published in the series Research in History and Philosophy of Mathematics. (January 2018). My short paper "On Dedekind's axiomatic approach to the foundations of mathematics" has been published in the proceedings of the "In Memoriam Richard Dedekind (1831–1916)" conference, held last year in Braunschweig (September 2017). My paper "On Frege's Begriffsschrift notation for propositional logic: Design principles and trade-offs" has been published online in History and Philosophy of Logic (May 2017).